Our Products >> Gift & Promotional Items - Shirts, Stickers, Steins, etc. Old school cool! Our Kaddie Shack high quality t-shirts are sure to be a hit with any VW enthusiast. They are 100% cotton Gilden™ shirts, super comfortable, and built to last, just like the other products we sell. How cool is this? Here's a high-quality Flexfit baseball cap embroidered with our Kaddie Shack logo. Perfect for any VW enthusiast or Kaddie Shack fan! One size fits most. Official Flex-fit size is listed as L-XL. Everybody loves stickers, right? We'll send a pair for your toolbox, car, or wherever your sticker collection is! Kaddie Shack Gift Certificates are available. Tell your loved ones, or buy one for someone you love! Available from one dollar to a million! You choose! Simply select the amount you want to give in US Dollars in the quantity column. We will email you a copy to print and wrap up for that special day. Here's a fun little addition to your car. Measures 3-3/4" x 1-1/2". Reads CAUTION: DO NOT LOWER WINDOWS AT SPEEDS IN EXCESS OF 200 M.P.H. Celebrate VW racing, old school tradition and style, and all the best of the Norris/Kadron performance combo with this exclusive t-shirt. It's bound to be a collectors item in just a few short years. 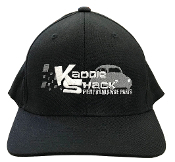 Get your Official Kaddie Shack T-shirt and drive in style in your VW! Note: since we have very limited quantities left of these, we may substitute the current 2017 t-shirt design if we are out of the specific size you need.